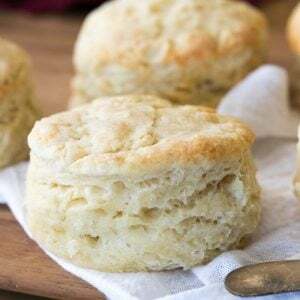 Buttery, soft, and made completely from scratch, this easy homemade biscuit recipe deserves a permanent place in your recipe repertoire. 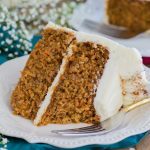 This recipe is made with all butter, no shortening! 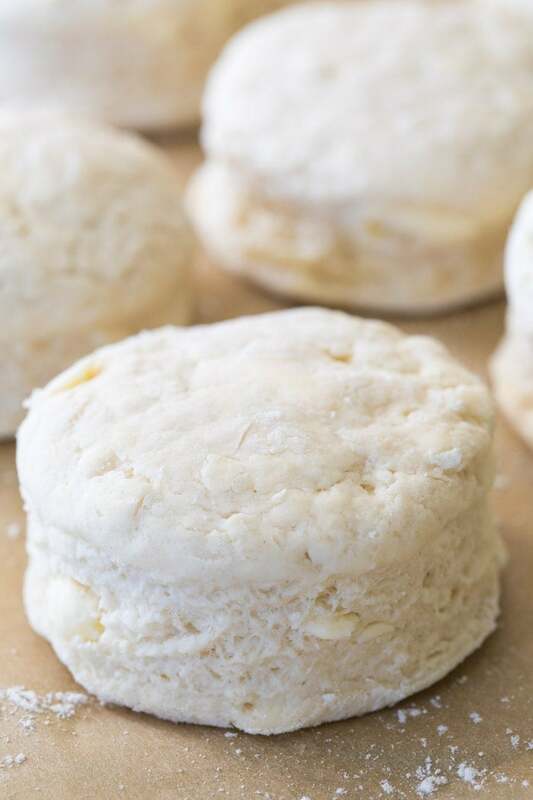 With just 6 ingredients that I bet you already have on hand, these homemade biscuits are so simple to make and I’ve included plenty of tips (and a video!) 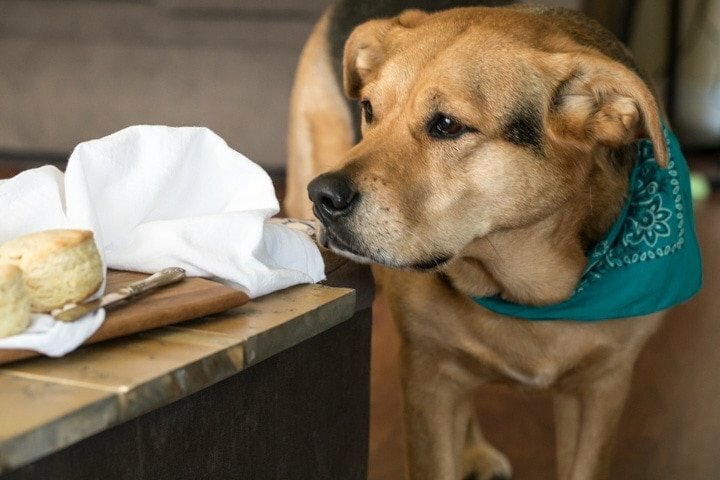 to make sure you end up with perfect biscuits every single time. One: because homemade biscuits are delicious (obviously) and they’re so easy to make. So many people buy the canned version without realizing that they already have all of the ingredients to make them from scratch in their pantry. The taste of a pre-made biscuit doesn’t hold a candle to a homemade biscuit. Not. even. close. Preservatives and artificial flavors, you aren’t welcome here. 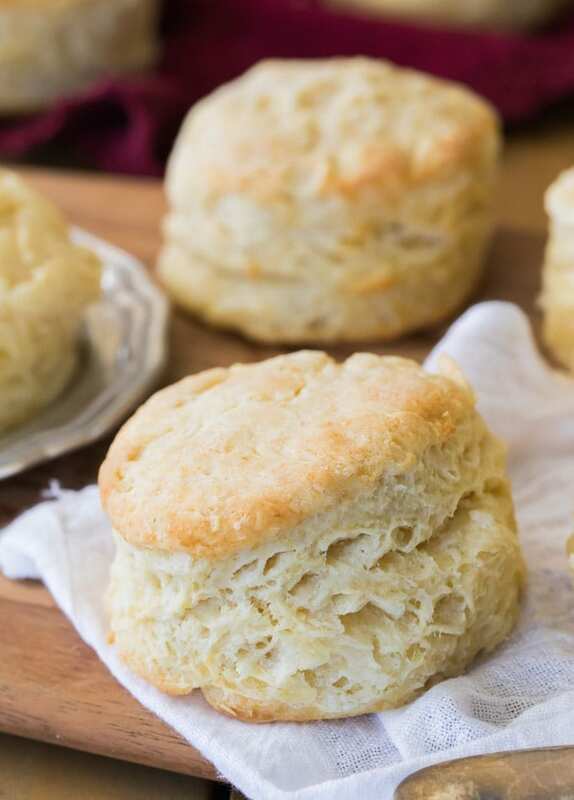 Two: because ever since I started working on this biscuit recipe a few weeks ago, “Mind Your Own Biscuits” by Kacey Musgraves has been stuck in my head and I’ve been singing it off-key relentlessly. Don’t get me wrong, I love Kacey Musgraves and her music, but every time I start singing my dog starts actually crying. It’s sad and hilarious, and if I wasn’t so embarrassed by my terrible singing voice I would have shared a video of it by now. Hopefully, by publishing this recipe I’ll release myself from the endless refrain and the animal abuse will finally stop. But let’s talk more about the first reason. 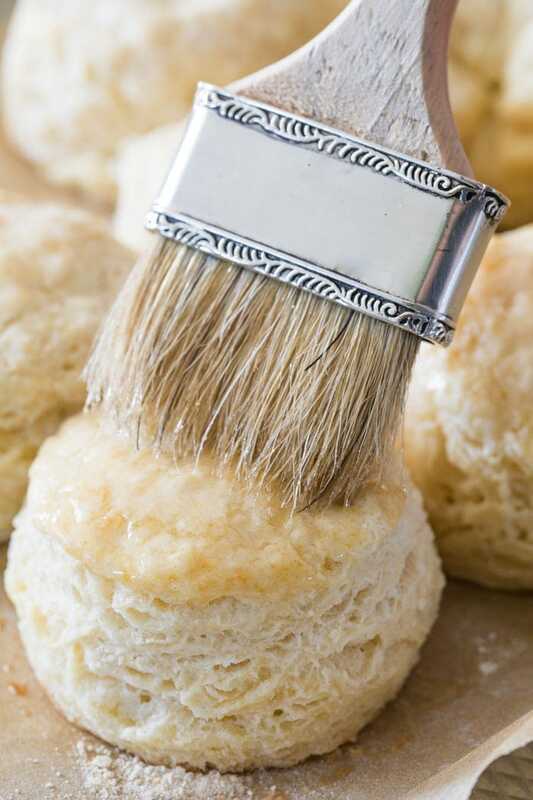 Homemade biscuits call for just six ingredients: all-purpose flour, baking powder, sugar, salt, butter, and milk. And then more butter once they’re finished baking because of course we need more butter. I mentioned that these biscuits are easy so do not be alarmed by all the tips that I have for you below. 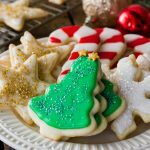 These biscuits are easy, but technique matters and I want to arm you with all the information that you need so that you can make these easily and have them come out perfectly the very first time. The tips are simple but important, and while some more seasoned bakers already know them, I want to give everyone an even playing field. The butter and milk for this recipe need to be as cold as possible for fluffy and soft biscuits. I freeze my butter before using it and recommend keeping the milk in the refrigerator right up until it’s time to add it to the dry ingredients. Don’t overwork the dough! Keep in mind that you want your butter to stay as cold as possible when making these biscuits, and the more you have your hands on the dough the softer the butter will become. 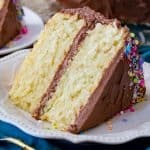 Definitely don’t use an electric mixer for this recipe. We’re going to do a little bit of laminating. This means folding the dough over itself multiple times (5-6 times here) to encourage flaky layers in our biscuits. You can watch the video below to see exactly how this is done. Don’t use a rolling pin, use your hands to gently work the dough into a flat rectangle before cutting out your biscuits. 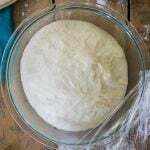 Don’t be afraid to add flour to the dough if it’s too sticky while you are handling it (and make sure to work on a lightly floured surface). Visual clue: If you look at the pre-baked biscuit below, you’ll see that you can actually see the butter pieces in the dough. This is what you want, the ingredients won’t be well-combined like with a cookie dough and seeing bits of butter means you’ve actually done everything right here. Hooray! The butter is possibly the most important part of this recipe, and the way you handle it can make or break your homemade biscuits. While you can certainly use a pastry cutter to cut your butter into the dry ingredients, I recommend freezing your butter for about 30 minutes before beginning. Then, use a box grater to grate the butter before combining this in with your dry ingredients. 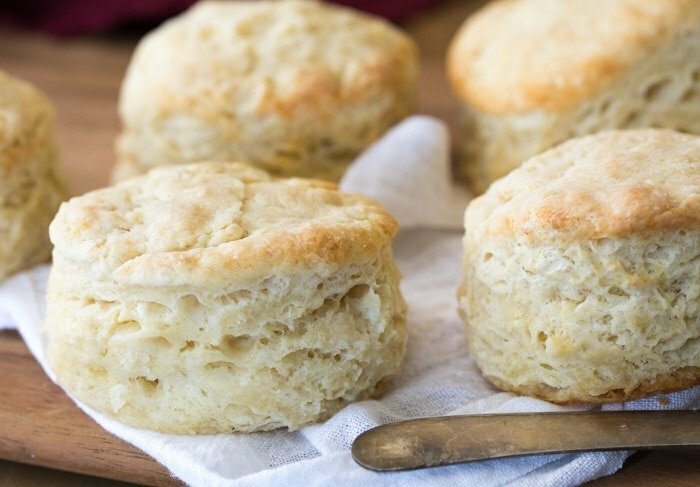 I use this technique in my scone recipes and highly recommend it with these biscuits, too. Not only is it much easier than using a pastry cutter, but it does a great job of finely shredding and distributing the butter throughout the mixture without overworking the butter (remember, you want to manage the butter as little as possible so that it’s as cold as possible when going into the oven). Alternatively you could also use a food processor (like I do with my pie crust recipe), but it’s just so easy to grate in the butter that I always use this method instead. And yes, I do recommend using unsalted butter in this recipe and then adding salt. 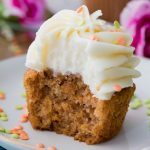 If you want to know more about why I write my recipes this way, you can read all about it (and an easy substitution if you only have salted butter on hand) in this post that I wrote about salted vs unsalted butter. I know I’ve mentioned to you guys a few times that I’ve been working on a baking contest/challenge/I’m really not sure what to call it, but I’m planning a post where I encourage all of you to bake along with me. 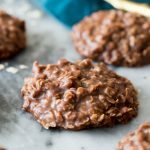 The goal is to get people baking recipes they may have not tried before, and I’m encouraging everyone to share their results for a chance to win a small prize. Well, today’s homemade biscuit recipe is essentially the base for the baking challenge that I’ll be sharing in exactly one week, so take this as a hint that making today’s recipe is a great way to get a jump start for the challenge! 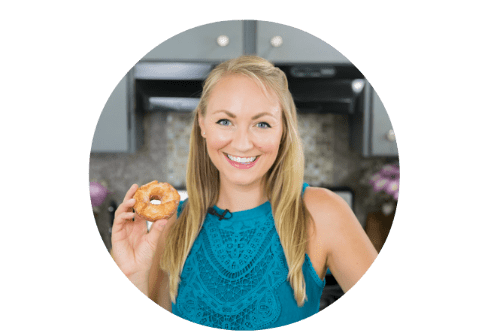 To make sure you’re among the first to be notified of all new recipes and baking challenges, make sure you’re subscribed to my e-mail list. 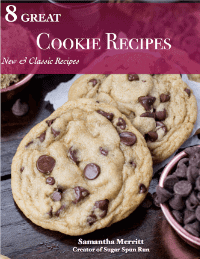 It’s free, and you get a free e-book of 8 of my favorite cookie recipes. I know I talked a lot in this video, but I really feel that the tips are so important, and will help ensure your biscuits come out perfectly! This recipe can be doubled to make 12 biscuits. For best results, chill your butter in the freezer for 10-20 minutes before beginning this recipe. It's ideal that the butter is very cold for light, flaky, buttery biscuits. 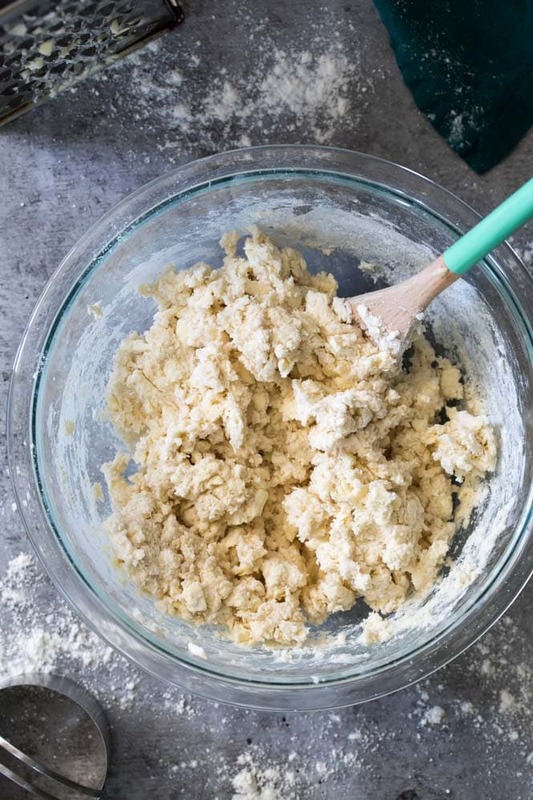 Add milk, use a wooden spoon or spatula to stir until combined (don't over-work the dough). Use your hands (do not use a rolling pin) to flatten the dough to 1" thick and lightly dust a 2 3/4" round biscuit cutter with flour. Repeat until you have gotten as many biscuits as possible and place less than 1/2" apart on baking sheet. Penny likes to supervise the photography process. Fortunately, this setup got her vote of approval. I loved this recipe. My biscuits were soft and delicious! Your tips and the videos were very helpful. I have a tips of my own to add. I put the box grater in the freezer too. 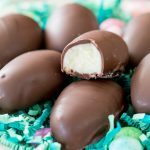 This is my first on line recipe and it was great! I only had buttermilk on hand but they turned out perfect. The butter grating and folding and COLD seemed to make all the difference. For the first time in life I made perfect biscuits. It was fast and easy too. I put the biscuits in the freezer until the oven was ready (forgot to preheat, lol). Thanks so much! These biscuits came out great! Would definitely need to double next time. Everyone loved them and wanted more. 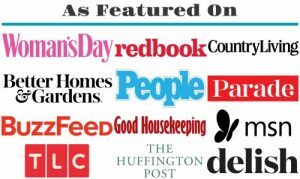 So glad to hear this! Thanks for commenting, Dorothy! 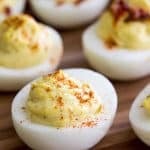 I want to make these but don’t have milk, can I use half and half or heavy whipping cream? I add a bit more water to the cream when substituting for milk. Wow this is my first tine to make biscuits and turned out excellent!! We went to one of the gourmet restaurant and ordered a breakfast, i chose to have biscuits which is the reason why i made this today! I fell in love with the taste of it and would surely be making more in the future!! This is the best biscuit recipe thus far (and I’ve tried many). I did tweak it a teeny bit by adding some cream cheese and yogurt (reduced the milk). But I’m thankful for your tips in keeping everything cold and folding the dough for a flakiness. Will be following you for sure! I have never made biscuits before. Today was the first time. We had biscuits, gravy, eggs and bacon. It was a huge blessing. Thank you for your help! I did it! 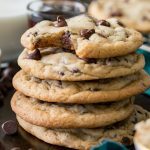 I can’t make biscuits and I still made these too tall but FLAVOR is great and the texture is amazing! Thank you!!! Could I use this recipe as a pie crust for a chicken pot pie? I’ve made this biscuits before for Thanksgiving, and they were a HIT. I want to make this recipe the night before I start the chicken pot pie, roll it in a ball, and flatten when I’m ready to bake. Is this doable? I cannot make biscuits! For years I’ve tried recipe after recipe only to create hard as rock biscuits. 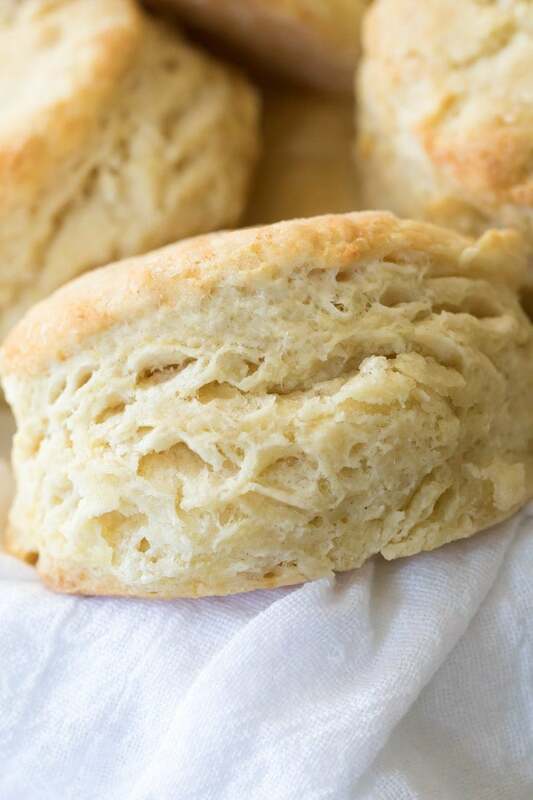 It’s been on my bucket list to make a soft, flaky biscuit. Well, today was the day! I followed your recipe and tips and they are beautiful and delicious!! Thank you So much! Especially for the folding tip and the cold as ice butter and milk tip! I love you and I love your biscuits!